NIFTEM Recruitment 2018 – Apply Offline for Teaching & Non Teaching Posts: National Institute of Food Technology Entrepreneurship and Management (NIFTEM) has advertised a notification for the recruitment of 41 posts of Teaching & Non Teaching vacancies. Eligible candidates can apply online from 24-04-2018 to 24-05-2018. Other details like age limit, educational qualification, selection process & how to apply for NIFTEM Jobs are given below. Interested Job Aspirants who are ready to apply for National Institute of Food Technology Entrepreneurship and Management 2018 Notification must possess the below-given Eligibility Details. 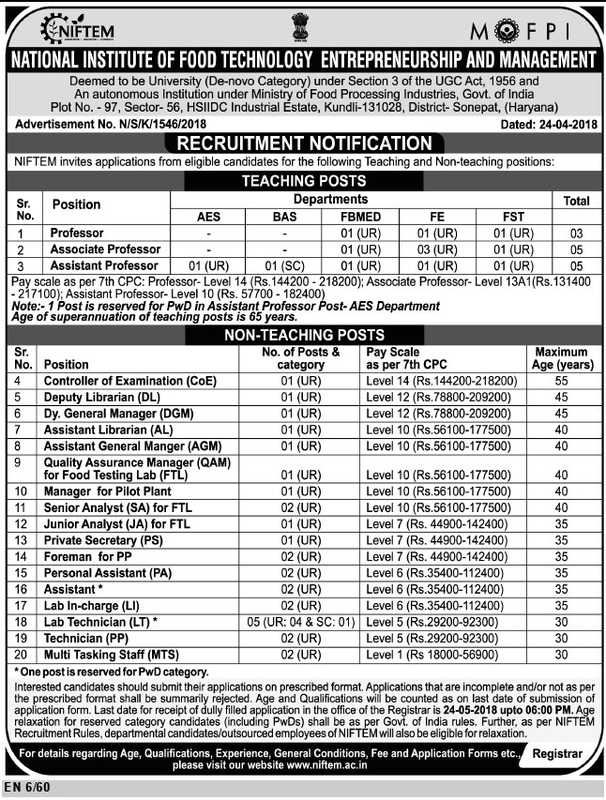 Application fee for Level- 10 posts and above as indicated in the advertisement is Rs.1000.00 for General (UR) & OBC and Rs.500.00 for SC/ST. In respect of the posts Level -7 and below the application fee (Non-refundable) is Rs.500.00 for General (UR) & OBC and Rs.250.00 for SC/ST. Eligible and Interested Aspirants are requested to Download Application Form from Below link of www.niftem.ac.in Website and Submit it to the mentioned Address before Last Date i.e., 24-05-2018.